Phew, again we knew it was going to be an expensive month, but let me say it one more time, phew. 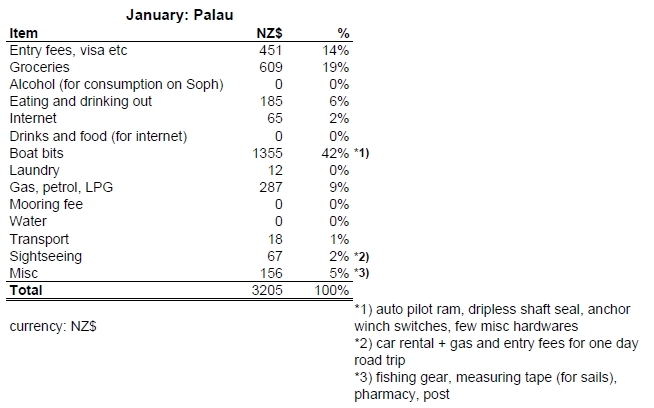 January has been our most expensive month so far at NZ$ 3205. The by far biggest cost is boat parts and mainly a new tiller auto pilot ram, which was US$ 700. Add a dripless shaft seal (US$ 300) plus a few other bits and bobs, including new anchor winch switches which Sheralee is bringing along in her suitcase when she comes to visit tomorrow. One small new change to the budget is eating out which now includes drinking out, as that item normally is very small and it's natural that when we eat out, we sometimes drink alcohol with the food, although generally not much, we are pretty boring. I think back in Tonga we used to include non-alchoholic drinks in that category, so this way it's easier anyway. A fairly large part of eating out is actually ice cream, we (OK, mostly me) are pretty addicted and Palau (well, US really) has some really good ice creams, one example is snickers brownie sandwich ice cream, yum! Another bigger than usual cost is groceries. There's no excuse really, except when there's a huge (compared to what we're used to) selection, it's easy to buy lots of food, including some more exotic and expensive things. We haven't even stocked up Sophia very much, as we know there will be good and cheap food in Philippines. The entry fee and visa item is pretty ridiculous big also. Palau sure knows how to make money on cruisers! The entry fee was paid back in December, so January's amount includes: rock island permit for 10 days cruising (US$ 120), visa extension for another 30 days (because auto pilot was delayed from US) for us and Sophia (US$ 150) and exit fees (US$ 100).